The NewsLine: NASA Makes New Planet discovery. NASA Makes New Planet discovery. WASHINGTON - An orbiting NASA telescope is finding whole new worlds of possibilities in the search for alien life, spotting more than 50 potential planets that appear to be in the habitable zone. In just a year of peering out at a small slice of the galaxy, the Kepler telescope has discovered 1,235 possible planets outside our solar system. Amazingly, 54 of them are seemingly in the zone that could be hospitable to life - that is, not too hot or too cold, Kepler chief scientist William Borucki said. Until now, only two planets outside our solar system were even thought to be in the "Goldilocks zone." And both those discoveries are highly disputed. Fifty-four possibilities is "an enormous amount, an inconceivable amount," Borucki said. "It's amazing to see this huge number because up to now, we've had zero." The more than 1,200 newfound celestial bodies are not confirmed as planets yet, but Borucki estimates 80 per cent of them will eventually be verified. At least one other astronomer believes Kepler could be 90 per cent accurate. After that, it is another big step in proving that a confirmed planet has some of the basic conditions needed to support life, such as the proper size, composition, temperature and distance from its star. More advanced aspects of habitability such as atmospheric conditions and the presence of water and carbon require telescopes that aren't built yet. Just because a planet is in the habitable zone does not mean it has life. Mars is a good example of that. And even if some these planets are found to contain life, it may not be intelligent life; it could be bacteria or mould or some kind of life form people can't even imagine. All the celestial bodies Kepler looks at are in our Milky Way galaxy, but they are so far away that travelling there is not a realistic option. In some cases it would take many millions of years with current technology. But what Kepler is finding in distant parts of the galaxy could be applied to exploring closer stars, astronomers say. "Our grandchildren will have to decide what's the next step," Borucki said at a NASA news conference. "Do they want to go there? Do they want to send a robot?" Before Wednesday, the count of confirmed planets outside the solar system stood at 519. That means Kepler could triple the number. And those findings are from Kepler's scanning of just one four-hundredth of the night sky, so the actual number of planets out there is presumably hundreds of times greater, Borucki said. That is exciting to astronomers, since the more planets there are, the greater the odds that life exists elsewhere in the universe. Yale University astronomer Debra Fischer, who wasn't part of the Kepler team but serves as an outside expert for NASA, said the new information "gives us a much firmer footing" to hope for worlds that could harbour life. "I feel different today, knowing these new Kepler results, than I did a week ago," Fischer said. She said Kepler "has blown the lid off of everything we know about extrasolar planets." Another outside astronomer, Lisa Kaltenegger of Harvard University, called the findings "exciting good news." 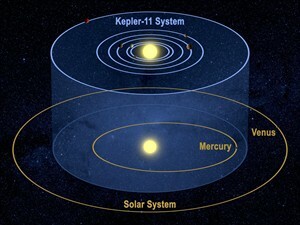 Kepler also found that there are many more relatively small planets than there are giant planets. That is encouraging, too: Astronomers think a planet needs to be solid - rocky like Earth or Mars - for life to develop. And very large planets are unlikely to be solid; they are more prone to be gas behemoths like Jupiter. Sixty-eight of the planet candidates Kepler found are considered Earth-sized, including the first ones ever discovered to be smaller than Earth. An additional 288 planets were less than twice the size of Earth, which is still in that optimum zone for life. Only five of the 54 potentially habitable celestial bodies are close to the size of Earth, while the rest approach the gassy girths of Neptune or Jupiter, Borucki said. To be in the habitable zone, a planet has to be the proper distance from its star so that it could have liquid water on its surface, at least sometimes. NASA considers habitable-zone temperatures to be roughly between 0 degrees and 200 degrees Fahrenheit (-17 to 93 Celsius). The proper distance varies by star; smaller, weaker stars, for example, would require planets to be closer to be habitable. Because of the various factors that could make planets more prone to life, University of California Santa Cruz astronomer Greg Laughlin created a formula that puts a dollar value on these far-off planets with the idea that the first planet that is incredibly similar to Earth would have a value of $1 million. Until Wednesday, the highest value Laughlin assigned to an exoplanet, which is what astronomers call a planet outside our solar system, was a measly $158. One of Kepler's new discoveries is worth nearly a quarter-million dollars, Laughlin figures. Kepler was launched in 2009 and orbits the sun between Earth and Mars. It needs time to find planets, identifying them by watching them repeatedly move past the star they orbit. Kepler scientists are strict about calling candidate planets confirmed. Of 400 candidate planets announced last year, only nine of Kepler's discoveries had been confirmed before Wednesday. Of the more than 800 new candidates, both in and out of the habitable zone, only six are confirmed, all way too hot for life. And they are strange - all densely packed and circling a single star. Five of them are closer to their star than Mercury is to our sun, and they move in precise circular and stable orbits.